Checks specified remote hosts availability and notifies you. Is there a better alternative to Ping Pong? Is Ping Pong really the best app in Internet Utilities category? Will Ping Pong work good on macOS 10.13.4? 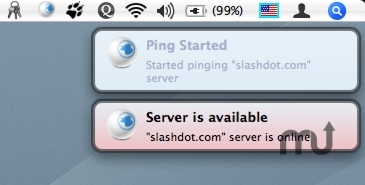 Ping Pong is a Mac OS X application which continuously checks if specified remote hosts are available and notifies you if they are down (and if they are up again). You can select how often you want "ping" to happen, choose method of notification (visual, voice, email, etc.). If you need to monitor a busy server which doesn't always respond in time you can specify the number of lost packets which is tolerable. Ping Pong needs a rating. Be the first to rate this app and get the discussion started!